NASA&apos;s soon-to-be-retired space shuttles are up for grabs. 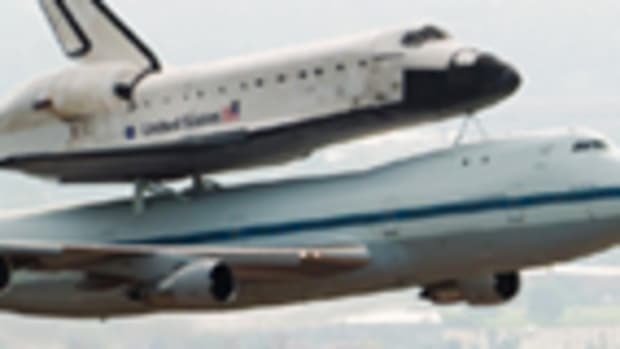 The space agency said Wednesday it&apos;s looking for ideas on where and how best to display its space shuttles once they stop flying in a few years. It&apos;s put out a call to schools, science museums and &apos;other appropriate organizations&apos; that might be interested in showcasing one of the three remaining shuttles. &apos;The orbiters will not be disassembled for transportation or storage,&apos; NASA insists in its nine-page request for information. Imagine the cachet of owning your own space shuttle. "Yeah, ladies, a Ferrari is fine for most guys, but do you know a lot of other guys who have a vehicle that&apos;s been in SPACE? With a ROBOT ARM? Well..."
A "Comet" Hits Jupiter. Riiiiight.